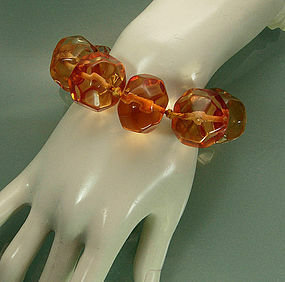 Jeweled clasp bracelet made from amazing very big and heavy Lucite beads in a pale amber color which shades for a fabulous ombre effect. The designer Ugo Correani has had his own label since the 1970s, and also has designed jewelry for Valentino, Fendi, and Versace, as well as Karl Lagerfeld and Christian Lacroix. Hand knotted with matching heavy cord. Marked CORREANI and MADE ITALY. With slide clasp with faux pearls glued around a flower form design of prong set glass stones in topaz and garnet. Gold tone metal. Wearable length is 9 inches. 1 3/4 inches wide at clasp. Excellent condition with some stretch to the cord. Photos enlarged to show detail. Display form is life size.